Platform 21 - Downloaded over one million times! Downloaded over one million times! 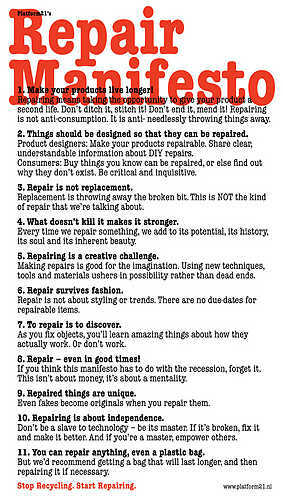 Platform21’s Repair Manifesto opposes throwaway culture and celebrates repair as the new recycling. The last few months the Manifesto has been downloaded, blogged about and adopted all over the world. The Repair Manifesto is part of the project Platform21 = Repairing for which we sought to make repairing cool again – over a period of five months. Both with the help of designers and visitors, new repair techniques were developed and many ingenious repairs were carried out in Platform21. Although the project has now ended in Platform21, it doesn't mean we are dropping the repair mentality. Platform21 = Repairing will soon travel to New York, and we hope the manifesto will keep inspiring people to STOP RECYCLING and START REPAIRING! So rediscover the joy of fixing things and share your repair knowledge. Together we can keep this movement going, one that isn’t new per se but has been forgotten. Click on the right top corner of the manifesto to enlarge. TV station Planet Green also wrote about recycling and packed the article with good links! John Chipchase discovered social and informal local networks of repairmen, knowledge and... schools.